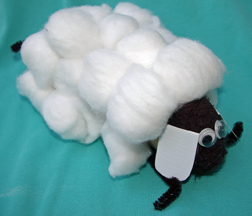 Celebrate Easter or a farm theme with this sheep: a toilet paper tube and cotton balls. Preschool kids could also make this craft for a March comes in like a lion and goes out like a lamb theme. How to Make It: Cut pipe cleaner in half (adult job). Fold each pipe cleaner into a U shape and tape to bottom of toilet paper tube for legs. (These will probably not be sturdy enough for your sheep to stand on, so he’ll need to be resting, or use something stronger, such as painted dowels.) Use glue to cover top and sides of paper tube with cotton balls. Stuff black pompom, tissue paper or fabric into one end of tube for head. Cut two ear shapes from white cardstock and glue to head. Glue on googly eyes. This entry was posted on Sunday, April 5th, 2009 at 12:22 pm	and is filed under animal crafts, Easter crafts, paper tube crafts. You can follow any responses to this entry through the RSS 2.0 feed. Responses are currently closed, but you can trackback from your own site.